Water can be dangerous, which is why it’s prudent to always take proper safety measures when at the pool and beach. 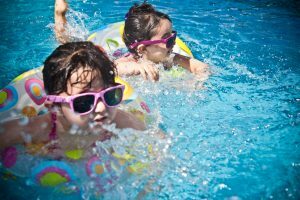 Many pool accidents occur due to improper supervision and not knowing how to swim, but you can help prevent these situations from occurring by following a few simple tips. And when you find your home to be a mess after those beach and pool days, contact The Maids, a premier house cleaning company in Greensboro, NC to take care of the mess. One of the most important things when it comes to pool and beach safety is teaching children how to swim. Your local YMCA offers group and private swimming lessons for both members and nonmembers. If the YMCA is not for you, there are many local swim classes available such as the ones offered at Star Aquatics. Even if they are excellent swimmers, all kids should be under constant supervision when they are in or near the water. Statistically, most children who drown had a parent nearby, who was out of sight for less than five minutes. If you have to leave for some reason, make sure your child is out of the water and a safe distance away from it. Also, be sure to lock pool gates when you’re not around to supervise your child in the pool. Part of pool and beach safety is protection from the sun. Apply sun protection thirty minutes prior to going outside and reapply every forty minutes with a water-resistant sunscreen or every eighty minutes with a water-proof sunscreen. Chlorine will strip away sunscreen, therefore, if you are getting in and out of a chlorinated pool, you may want to apply more often. Consider wearing a hat and sunglasses when not in the water, to protect your eyes, face, and hair from the sun’s harmful rays. Be sure to follow any rules and warning signs at the public pool – and at the beach (especially if there are jellyfish sightings or high tides at the beach). Lifeguards and other pool personnel are there for your protection and safety and that of other swimmers, so be sure to listen and follow their instructions. Even at home, it’s a good idea to follow the essence of the safety regulations you’d find posted at a public pool. A few examples of these include: walk, don’t run, along the sides of the pool; don’t let children swim unsupervised; always double check the depth of the water before diving; and don’t get in the pool if you have any open wounds or a contagious illness. These standard safety provisions are good for any pool, public or private. CPR training is highly recommended if you have a pool, even more so if you have children. At least, this way, if something were to happen you would know enough to help before EMS arrive on the scene. It’s easy to sign up and take a class by doing a quick search online and it could save a life. After the kids have tracked water and dirt from the pool into the house, have The Maids, a healthy house cleaning company in Greensboro, come clean it up. The Maids’ experience and thorough cleaning process are backed by a 100% satisfaction guarantee. Call (336) 292-7805 for a free estimate.